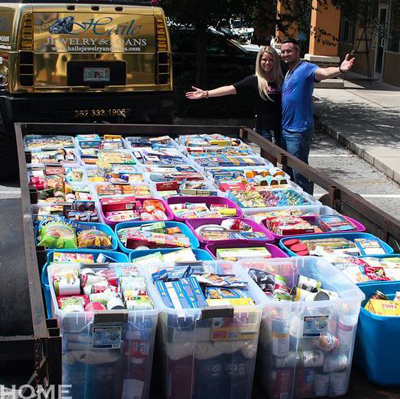 Efforts from Haile Jewelry & Loans 3rd Annual “Fill the Hummer” food drive translated to over 3,834 pounds of food, 12 reusable plastic bins, & the priceless value of raising awareness! Thank you to Haile Jewelry and Loans for their amazing efforts, KISS 105.3 for their generous announcements promoting the event, HOME: Living in the Heart of Florida Magazine for matching Fridays’ donations pound for pound, I Love NY Pizza …(Gainesville Fl) who graciously agreed to feed everyone a slice of pizza for their donations made on Saturday August 23rd, to all the businesses & individuals that donated a prize for the raffle, and to all the donors who brought food. Thank you for “Filling the Hummer” together! !